In our Ask the Expert column, we regularly ask Terry Slattery, a graduate engineer and bluewater cruiser who does all his own boat maintenance, to suggest an unusual tool or gadget to add to your onboard tool kit. This month’s suggestion: a mechanical endoscope. Curious about how to use it and where to get it? Terry explains. An endoscope can help you see into hard to reach places on your boat. Q. In recent months you’ve recommended that boaters carry a mechanic’s stethoscope and a sports camera in their tool kits. 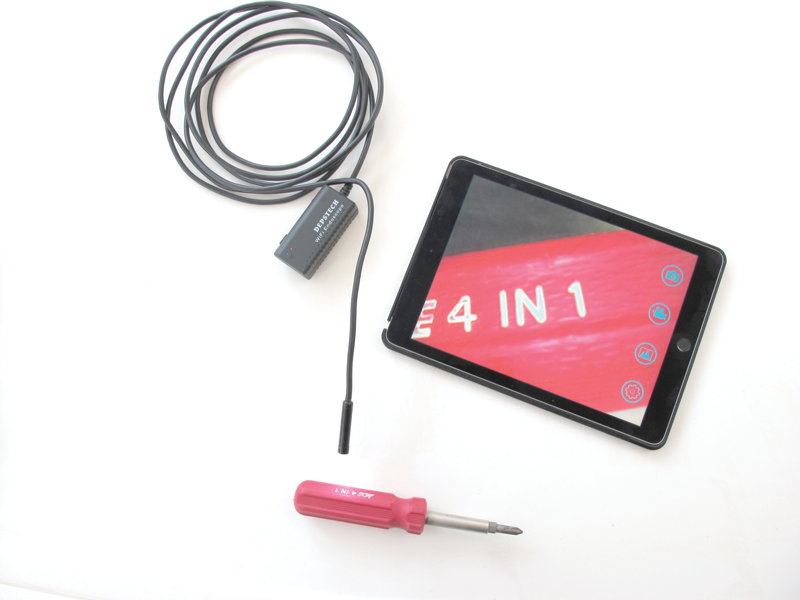 What does having a mechanical endoscope onboard contribute to your troubleshooting ability? A. A mechanical endoscope, sometimes called a borescope, is basically a narrow flexible tube that serves as a tiny telescope and enables you to inspect portions of your boat that would be difficult to see without one—such as fuel tanks, water tanks, well-casings, and so forth. It’s easy to use, and it can help you avert problems in hard-to-reach places. A. It’s a lot like the endoscopes that physicians use to help diagnose medical problems. The tube contains cables that provide light to illuminate what you’re trying to see, a high-resolution camera, and thin optical cables that capture a picture of whatever is at the other end. The one I use transmits its image to my cellphone or tablet. It can capture still images or video. All you do is insert the endoscope into whatever closed container or hard-to-reach space that you want to inspect and turn it on. Presto! Turn on the light, and the camera begins operating; and your cellphone will display an image of whatever is inside. Because the tube is flexible you can bend it in advance to fit tight spots, probe around, and focus on whatever you want to see. The focus is normally fixed at about one to four inches, so you have to get close to see objects clearly. That’s normally not a problem in the small spaces where the endoscope is useful. Some models have waterproof cameras, and some have stiffer cables that help support the camera. The app on my tablet can record video or take pictures. Q. What exactly can you use it for? A. You can look into empty fuel tanks to see whether they’ve become contaminated with dirt or foreign particles; inspect the top portion of well-casings (at home); and look into places such as engine spaces, bilges, or stuffing boxes—places that often are impossible to get your head into so you can make a visual inspection. It’s really useful for spaces where a sports camera won’t fit. The more you think about it, the more uses you’ll find. A. You can get one that you can use with your cellphone for about $40 or $50. Just use your search engine and look for “android endoscope” or “iPhone endoscope,” and you’ll find a wide array of choices. The tubes come in varying lengths, from three or four feet to 10 or 11 feet. Buy one equipped with WiFi viewing, and you’re all set.